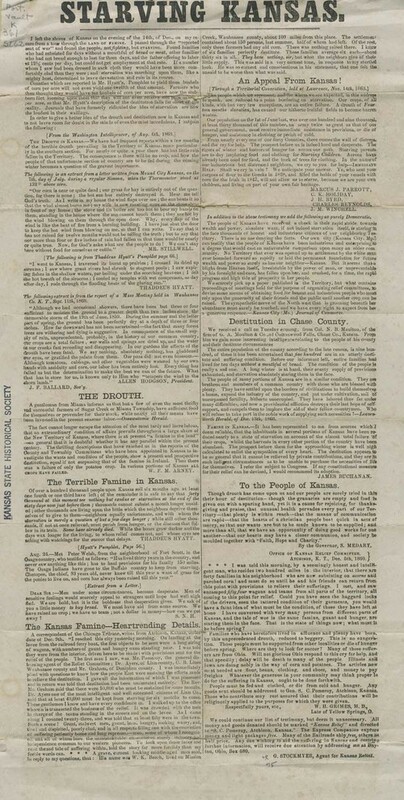 This broadside was prepared by G. Stockmyer, agent for Kansas Relief. It included descriptions of the conditions in most parts of Kansas Territory from individuals such as Thaddeus Hyatt, Allen Hodgson, and W. F. M. Arny and excerpts from various newspapers. Relief efforts were being coordinated by Samuel C. Pomeroy from Atchison, Kansas Territory. Freight and railroad companies provided free shipping for relief goods sent to K. T.